Relax and enjoy the fabulous ocean view from this St. Pete Beach Vistas on the Gulf fourth floor condominium! This fully equipped, luxury condo has everything your family will need for a relaxing oceanfront beach vacation. It has many family friendly upgraded amenities including second bedroom with two twin beds, television, and French doors for privacy; center island in kitchen for added storage and counter space; dining room with seating for six; refurnished living room with two rocker recliner chairs; refurnished balcony with counter height table and chairs for improved ocean viewing over the balcony railing; new stainless steel kitchen appliances including a full size dishwasher; new spacious walk in shower stall in master bath with improved accessibility versus original tub/shower combination design; and a reserved covered parking space near the elevator. This specific combination of upgraded features is only available in this unique family oriented unit within the Vistas on the Gulf facility. Comfortably sleeps up to six people. All linens and towels are provided. For your convenience the unit is equipped with a washer and dryer. Each bathroom includes a hairdryer and shower. Master bath has spacious walk-in shower stall and second bath has combination tub/shower. We have an excellent beach view from our balcony. Our building is a direct St. Pete Beach oceanfront property. The beach is accessed from our building's pool deck. We have an excellent ocean view from our balcony. This condo includes a reserved covered parking space under the building and close to the elevator. Reserved covered parking space next to the elevator, hair dryers, iron and ironing board, on-site rental management office, 3 cable TVs (living room has Roku smart TV, master bedroom and 2nd bedroom), coffee maker, toaster, blender and hand mixer, furnished balcony. We went for a quick family get-away and the location and condo were just perfect! Right on the beach, with a pool and hot tub if you prefer that. Close walking distance to stores and restaurants. Thank you for your review! We are so happy you enjoyed your stay. We reserved this unit for a funeral and it worked out really well. The unit doesn't look directly on to the ocean but you get a glimpse from the side of the building. The accommodations are dated but very nice. It is set up more like a hotel than a regular VRBO but we were able to have a nice family gathering and the pool and beach were lovely. Everything was clean and tidy. Condo was nicely equipped and clean. The two twin beds in second bedroom was just what we were needed for our family vacation. Beach was exactly what we were looking for and nesting colony of Black Skimmers just down the beach was a nice add. Thank you for your review. We are so glad you enjoyed your stay! Thank you for your review. We're so glad you enjoyed your stay! 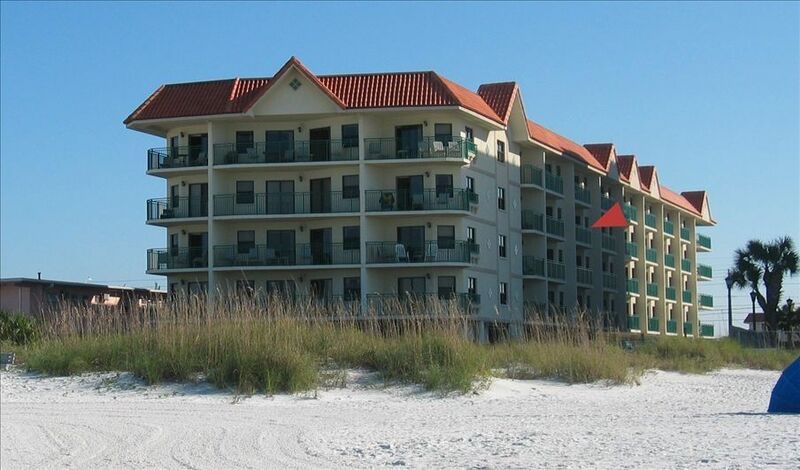 We hope you'll keep our condo in mind for future visits to St. Pete Beach. We enjoyed our stay at the Vistas. The condo was great, clean, fully equipped for all our needs, nice new appliances, especially loved the fluffy bath towels. Loved the location on St Pete Beach and proximity to restaurants and shopping. The management staff were always pleasant and helpful. Common areas were well maintained and Mark ensured bbq and pool area were clean and ready each morning . Bonus was the new bbq that were delivered while we were there. We experienced no problems with the WiFi for the month . Will definitely return. Thank you for your thoughtful review. We are so glad you had a great experience! We are constantly striving to renew and upgrade our condo. The Vistas staff likewise constantly strives to maintain and upgrade the common areas and grounds, and we appreciate your recognition of their efforts. It was our pleasure to serve you and we look forward to your return! The good: Very well kept unit with lots of amenities. Kitchen was easy to use and well stocked. Large for four people and beds very comfortable. Patio was comfortable and location was excellent; right on beach. Covered reserved parking space was a nice added touch. Owner was very easy to work with. Very accurate description. The not so good: The hot tub was only luke warm. The wifi was not good--very slow and dropped connections. There’s no shortage of things to do in the area. Stroll, jog, or play on the miles of sugar white sand beach. Take a dip in the on-site heated swimming pool or hot tub. With a central St. Pete Beach location, this unit is within walking distance of many great restaurants, bars, mini-golf, and a grocery store with shopping plaza. A short beach stroll away is the famous Don CeSar Hotel with restaurants, spa, and old-fashioned ice cream parlor that's great for the kids. Available for rent on the beach are cabanas, jet skis, kayaks, water-bikes, and parasailing. Busch Gardens theme park is less than a 45-minute drive away. Walt Disney World Resort and other Orlando area attractions are less than two hours away. Thirty minutes from Tampa International Airport and only 20 minutes away from the Clearwater/St. Pete airport. Peak season weeks are rented on a Saturday to Saturday basis, in full week increments (unless otherwise agreed by owner). Rental rates do not include cleaning fee, security damage waiver, or 13% Florida hotel sales tax.